Riley Schmiedt and Bailey Schmiedt, both of Woonsocket High School, qualified for the state wrestling tournament with second and third place Region finishes this past weekend. Riley Schmiedt, wrestling at 285 pounds, upset top-seeded Tre’zen Doren with a 6-2 overtime win in the semi-final round. Riley, a senior, finished Regions in second place in his weight class. Bailey Schmiedt finished third in the 170 pound weight class when he beat Kade Hellmann of Wolsey-Wessington. Bailey is a junior at Woonsocket and Riley’s cousin. State Wrestling begins Friday at the Denny Sanford Premier Center in Sioux Falls, with the first session at 10 a.m., and continues through Saturday. Riley is set to wrestle his first match against Garret Chicoine of Elk Point/Jefferson. Bailey will go up against Ty Haneke of Beresford/Alcester-Hudson in his opening match. Riley is the son of Adam and Jody Schmiedt of Woonsocket, and Bailey is the son of Dominic Schmiedt of Woonsocket, and Scott and Tonya Estabrook of Letcher. 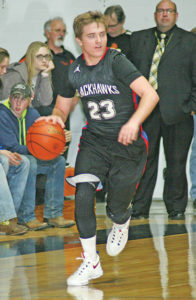 TREY WEBER shoots for his ninth three-pointer of the game last Thursday night, breaking the Blackhawk record. Trey Weber, a junior at Woonsocket High School, broke the Blackhawk record for the most three-pointers made in a game last week in Mitchell. Weber blew away the old record of six, with a stunning nine three-pointers last Thursday versus Mitchell Christian. The Blackhawks beat the Golden Eagles, 70-47, with Weber scoring the game-high of 30 points. He scored 29 of his 30 points in the first half and hit his nine three-pointers in just 10 attempts. The old record was a tie of six in a single game, held by Josh Feiner and Trevor Olson. Trey is the son of Rod and Tara Weber of Woonsocket. TRENT KINGSBURY brings the ball down court in a game earlier this season. With one regular season game to go, Kingsbury broke the Blackhawk single season assist record formerly held by his older brother. 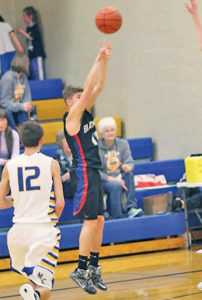 Trent Kingsbury, a junior at Sanborn Central High School, broke the Blackhawk single season assist record last Thursday in their win over Mitchell Christian. Kingsbury currently has 140 assists for the season, with one regular season game and the post-season left. He had a game-high 11 assists in the 70-47 win over the Golden Eagles. The record he broke was held by his older brother, Tucker Kingsbury, who had 139 in a season. Tucker graduated last spring. Trent and Tucker are the sons of Kevin and Lynette Kingsbury of Letcher.